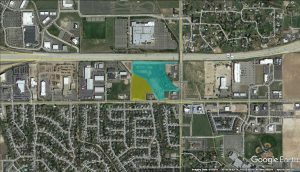 Land is annexed with two zonings available; 16 acres zoned C-C and 6.36 acres zoned C-G. Properties are adjacent to a high traffic convenience store/gas station with excellent visibility from both Overland and Locust Grove. Portions also have I-84 frontage. Properties are available for sale or build to suit.